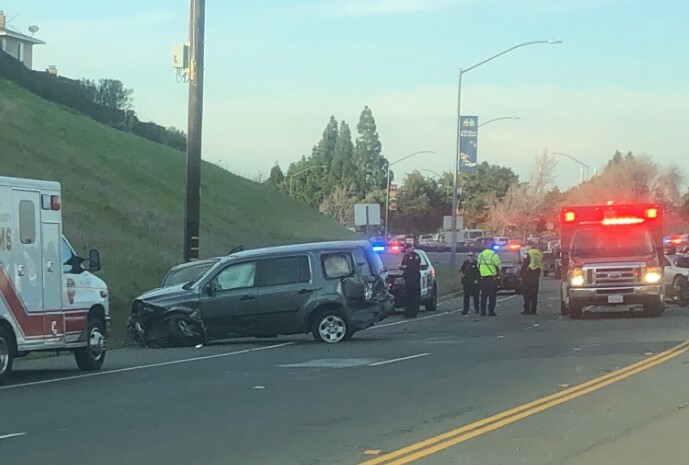 A multi-vehicle collision is blocking lanes on westbound Kirker Pass Rd. near the Kirker Creek apartments in Pittsburg. Airbags were deployed in several vehicles, and injuries have been reported. NOBODY uses turn signals and they’re all goofing around with the cellie phones. Because turn signals, goofing around, and ‘cellie’ phones were all mentioned in the article. Maybe try looking to your left and right every now and then. Being observant is not really that difficult. Well my first reaction is..I hope everyone will be ok! Sorry to hear there are injuries.. Nothing to do with turn signals folks. Drove by right after EMS arrived. This was a head on collision involving 3 cars. One driver with head injuries and a unconscious child in one car. I thought for sure a death had occurred. I sure hope that’s not the case here. Horrific!!!! I watched a driver go across the double yellow line in order to pass a car also going westbound right before where the K rail begins. ( just up from where this crash happened) There was no need for that. I was in the slow lane and there was room in front of me to pass me. I just cant believe how many crazy’s there are on the road. Way too many crashes every day everywhere. Was it some nut in a white Suburban? I watched this guy drive like a maniac from Oak Grove to Concord. He was passing on the right, tailgating, speeding, and making aggressive lane changes. It was shortly before the accident in Pittsburg. The funny thing was with all of this guy’s crazy driving, he really didn’t get anywhere. He kept hitting the lights and I’d catch up to him. There is a dip in both west bound lanes, in 40 mph zone, which over time has gotten worse. In past month or so there was temporary signage warning of the dip put up. Dip is more pronounced on lane closest to center median. Coming thru there just after 2 pm today traffic was reduced to single lane both directions, unsure what work was being done. Area in PIC appears to be in beginning of 55 mph limit after 40 mph zone. Wow sounds like the tidal forces are at it again. The ambient temps of the roadways have left safe stopping distances even more lengthened. Please slow down your speeds regardless of the posted speed limits. Some stupid idiot was making an illegal U-turn out there today from the Westbound fast lane. There was also road work going on out there today. A zillion guys look at a dip; then more further up the hill; couldn’t tell what they were doing at all.